Numerous activists were shot and killed by paramilitary goon squads of plain clothed police, state employees and their supporters, including American journalist and anarchists activist Brad Will. Once the uprising had been violently put down dozens of activists were disappeared, brutalized and raped by police forces. 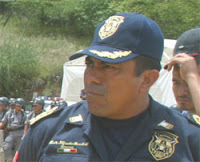 Barrita Ortiz, director of the Auxiliary, Industrial, Banking and Commercial Police, had been identified as having played a key role in the police operations during and in the aftermath the 2006 uprising. He was alleged to have been responsible for coordinating illegal detentions of activists, as well as extra judicial paramilitary operations during the uprising. 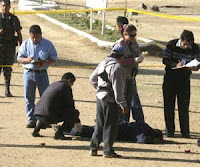 The assassination took place in the “El Tequio” sports park near the international airport. Accounts vary, one reports the assassins used a 380 and 9mm handguns, and another purports AK-47s were the weapons of choice. According to the second version, the assassins fled the scene in a red pick-up and a black Dodge Stratus.